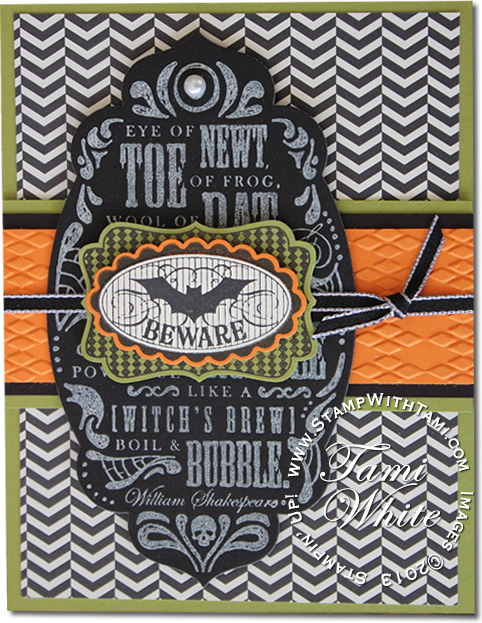 “Double, double toil and trouble; Fire burn, and caldron bubble.” from Shakespeare’s MacBeth comes to life on the Toil & Trouble stamp set – “Eye of Newt, Toe of Frog, Wool of Bat….” and especially fun combined with the Halloween Bash stamp set “Beware” Bat and label and coordinating punches and of course the Witches Brew Designer Paper. Check out my video tutorial below for some Halloween fun, and a laugh at what “toil & trouble” double sided paper can be. Created by Lori George. Many of these products are from the new 2013 Stampin Up Holiday Catalog. Thanks for another fun, inspiring, and invigoring video! Halloween is my favorite time for crafting. Another great card………love your videos. I love your Halloween cards. They are so cute!!! I do love the skulls!!! I love this card. What fun papers. I like that new stamp. Such a cute card tami. I’m taking a liking to the argyle embossing folder, it adds a nice touch to this card! Love Love Love this card! Great job! Great Halloween collection! I also just love all the label thinlits dies – they just make any card look more polished! Love Halloween and love this card! i cant wait to make it! LOVE LOVE LOVE the chalkboard look! I just love the colors.. they pop off the card! Love this card. Made some Halloween cards last night. Now more ideas to play with!